Puss n' Boat, Gay Frits, fancy beer, and lots of boats. Those are things that you might find in The Netherlands, or in my case, things I found in Amsterdam. The canals of the city reminded me of the Beirut song, by the same name. People seems to smile more there than in France (I know, I know, but I think the smiling has more to do with the culture than the pot.) There were blessed, blessed Thai food places, that served amazing, and spicy food, sans cheese, wine, or baguette.Bikes, bikes, and more bikes crowded every corner, and they had these hourly bike rentals that we have seen all over France and England as well. Overall, Amsterdam seemed like the kind of place I could spend more time, with people who spoke my language and shared some of my tastes and values. I have put together some of the highlights in a photo collage, for your viewing pleasure. Puss n' Boat isÂ aÂ cat adoption houseboat in Amsterdam. It's totally cute and filled with cats! I saw it because Â Alan and I ended up on Amsterdam's St. Nicholas Boat ClubÂ on a historic boat. The boat ride was not much of a tour, but just a normal guy who took us around the canals who liked to use the boat in the off time. It was also gay pride in Amsterdam. I have a questionable photo below of some gay frites. Just tilt your head to the left and look toward the pink to read the sign in the photo. We heard some live house music with a vocalist whichÂ wasÂ extraordinarilyÂ loud, but kind of cool. 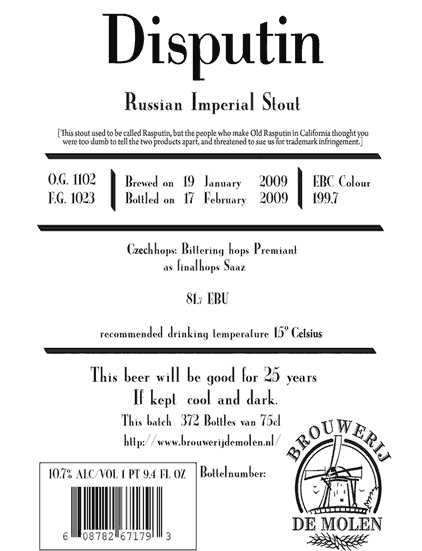 Also, take note of the image of Â Rasputin beer. This is the Dutch Rasputin beer, from Brouwerij De Moulen, not the American Northcoast Brewers.Â one. The barkeep told us that De Moulen was sued by Northcoast over the name Old Rasputin, so they had to release their Rasputin beer in the States as a different name. They released it as Disputin. Kind of genious!